Portfolio for Jira lets you make changes in your plan in a sandbox environment. While you're trying to create the ideal schedule for your team, you can make any changes and move issues around, without having to worry about how these changes impact the work of your teams in Jira. As a best practice, we recommend that you review and save your changes in Jira as often as possible. This gives your teams access to the latest updates you've made for the work that they're doing. To review the changes made in your plan, you'll need at least the Portfolio for Jira viewer permission. To save these changes in Jira, you'll need the Portfolio for Jira user permission. See Permissions in Portfolio for Jira for more details. While the changes are being saved, you can make Portfolio stop saving the rest of the changes. By clicking Quit, Portfolio will still save the change it's currently working on, but will not save the rest. 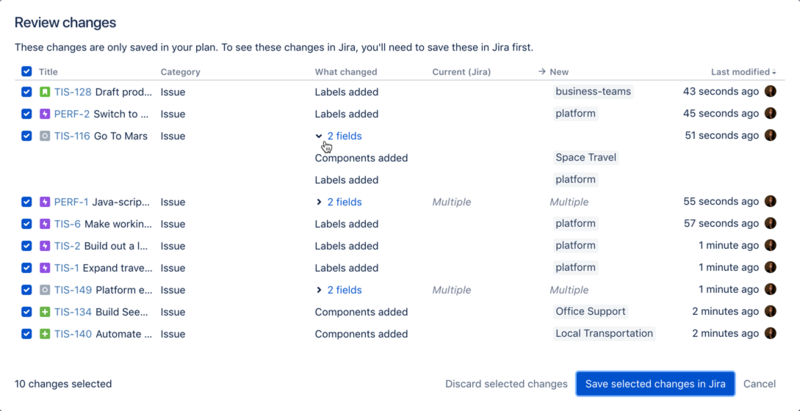 When you have required custom fields in your Jira issues, this may cause problems when you try to save some of the newly created issues in your plan. This is because Portfolio for Jira would not have the columns for the custom fields in the plan itself. Make the custom fields in your Jira projects no longer required. If the required fields are really necessary, make sure to enter the details for the required fields in the dialog that will display.